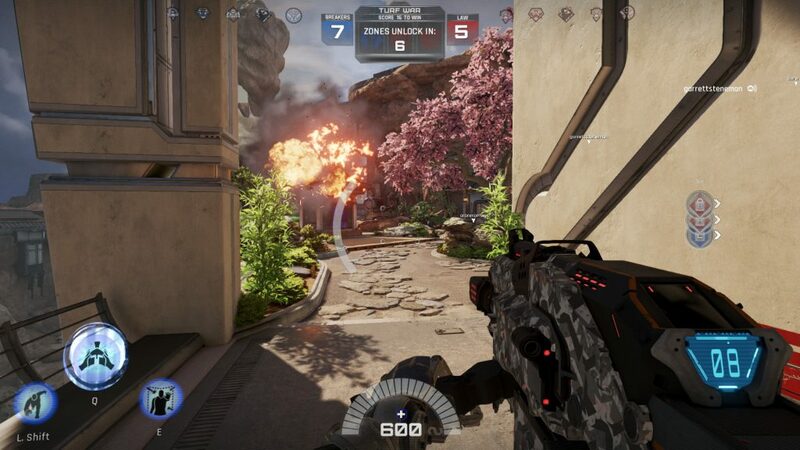 » PC Gaming » Is LawBreakers Just Another Arena Shooter? « Motospeed V30 Review, A Cheaper RGB Gaming Mouse? 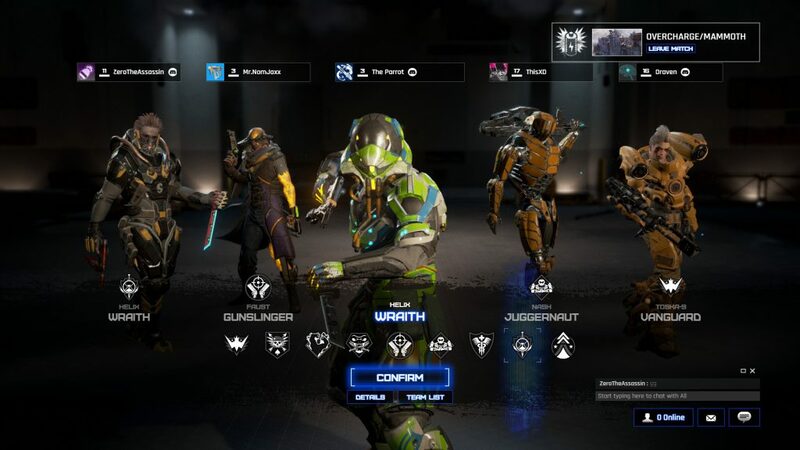 Is LawBreakers Just Another Arena Shooter? LawBreakers has been out for a couple of weeks now and I’ve been on and off with it in that time. I decided to pick it up because I love shooters like this! But honestly, from my own experience, it’s unique enough for me to enjoy and to not think that’s it’s a blatant ripoff. 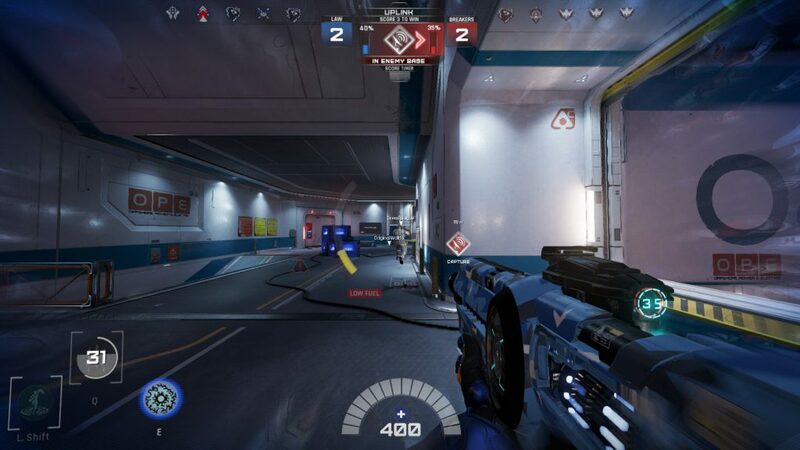 That’s what I’d like to express in this post – my overall experience with LawBreakers and how I don’t think it’s “just another arena shooter”. What Does “Gravity Defying Combat” Mean? 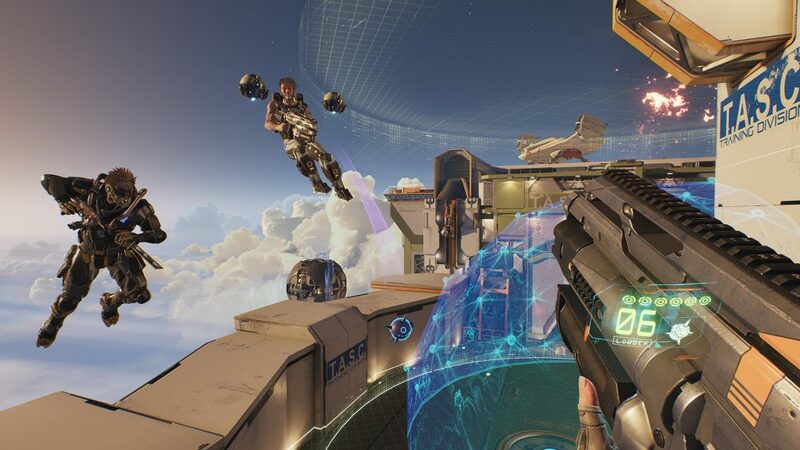 One of the unique parts about LawBreakers is the zero-gravity areas that are on every map. If you’re in a certain zone in a map, usually in the area where both teams must go to for the objective or sometimes even at your home base, you’ll be thrown into zero-gravity. This means when you jump, it’s going to take a while before you’re able to get back down to the ground. When you first start playing LawBreakers you’re going to be a bit confused and it wouldn’t surprise me if the zero-gravity caught you off guard the first time. But if you stick with it and get used to a few of the classes you’ll be flying around the map in no time. Seriously, you’ll either be using a jet pack to fly around or a zip line… Whatever floats your boat. The overall combat is solid. Every class has their own perks and skills they can use and everyone does their part to complete whatever objective is going on. There was a balance patch that released just a couple of days ago so with the game being out for only 2 weeks and there is already a balance patch, that tells me that LawBreakers isn’t a hit and run. These guys want to get this game to its greatest version. We’ll have to see what they add down the road but so far I’m digging the variety of the classes, maps and objectives. Every game mode is objective based and so far about 80% of the games I get into my team is trying to work towards completing the objective. For now there are four different game modes across seven maps. There are plans to add in more modes and maps but for now this is plenty, at least for me. Sure, I would have liked to see more maps on release but as long as the new maps coming out are going to be free content updates then I’ll be able to deal with having seven for now. The four game modes are Uplink, Blitz Ball, Turf War and Overcharge. Uplink is where there is a device in the center of the map and both the Law and the Breakers have to go and try to capture it. Once captured, you have to bring it back to your base and try to download the data from it. Once you reach 100% data downloaded then you have to wait a bit for the data to be transferred which will grant you a point. Three points total will win the match! Blitz Ball is like capture the flag but with a bit of a twist. Instead of having to capture an enemy’s flag, you’ll have to grab a ball from the center of the map and then score a goal in the enemy’s base before the ball explodes! First team to score eight points will win. This mode gets pretty intense as there are always ways to come back! Turf War is kind of like a capture the point mode with A, B and C areas. How it’s different than how it’s traditionally done (capturing a point and spawns changing from there) is that you’ll always be spawning on the same side, however you have a time limit to capture each point. You can spawn at A, capture A, fight for B while also trying to capture C. Once each point is captured, a reset timer is set and points are distributed. First to 16 points wins. This is my favorite mode for sure! 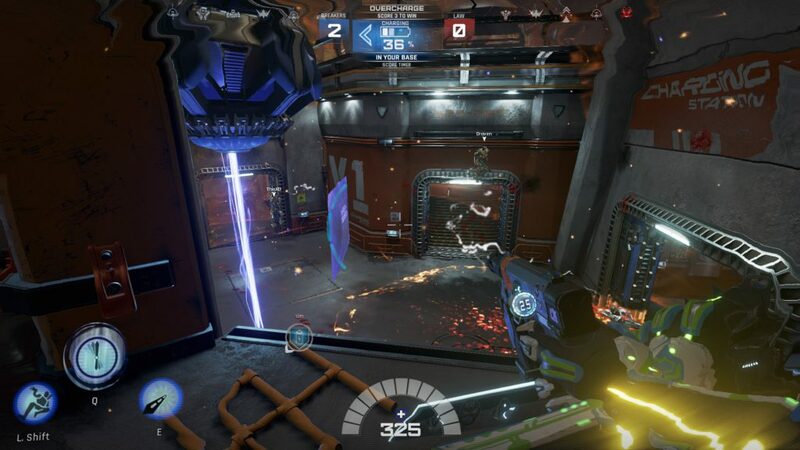 Overcharge is the last game mode and it’s kind of like Uplink. In Uplink, once the device is stolen then the data resets. You’ve got to download again. In this mode you have to capture a battery from the center of the map, bring it back to base and fully charge it to gain a point. The difference is that you don’t run out of charge when the other team steals the battery. This variety of game modes gives the game a sense of uniqueness. The maps are all very well balanced and they’re also all beautifully done! The center points of each map is where most of the chaos is at, as well as the zero-gravity. I touched on the combat a bit in the first section but now I’d like to elaborate a bit on the different playable classes in the game. Right now there are nine different classes to choose from. From tank-type classes to all out assassins – whatever you’re play style is, you’re bound to find something that you like. I’ve been enjoying playing as an Enforcer. The Enforcer has an assault rifle, is able to throw grenades that block abilities for a short period of time, is able to run fast, give teammates a speed boost and is also able to shoot homing rockets at enemies. Now I know that sounds super OP… Homing rockets? Crazy overpowered, right? Actually, it’s not! Every class has their one powerful ability which I suppose could be seen as an “ultimate” ability but the way they behave is different than say how an ultimate works in Overwatch. In Overwatch, the more damage you did and what not the more charged up your ultimate ability would get. 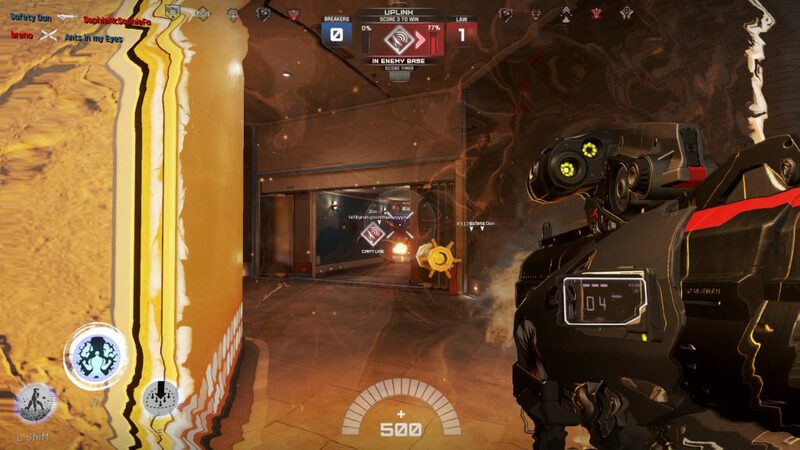 In LawBreakers, you’re just on a timer cool down. So you have to time this ability right, but in time you’ll be able to use it again and again. The Enforcer’s rockets are pretty nice, I also like the Titan’s lightening ability. You go into a full rage mode and shoot lightening from your hands while also boosting your health and armor. As I said earlier, there are plenty of different ways to play and you could either stick to one class or play different roles depending on what’s going on. Personally, I like to switch it up in-game. When we’re going for the objective quickly I like to go with Enforcer whereas if we’re trying to protect the objective I’ll go Juggernaut for a bit to create temporary shields and to play the tank so the team can deal all of the damage. I could get very detailed to each class but there are plenty of videos on YouTube if you’re wanting to get the specifics. To sum up the combat, everything seems well balanced. There is no “elite” class that completely dominates the rest of them. It all comes down to your skill and timing. PlayerUnknown’s Battlegrounds… Overwatch… There is a pattern of leveling up, getting a loot box or whatever and then when you open it up you have a chance of unlocking skins/cosmetics. It’s a cool system, I’m definitely not complaining here. If the wheel isn’t broke, don’t try and fix it. 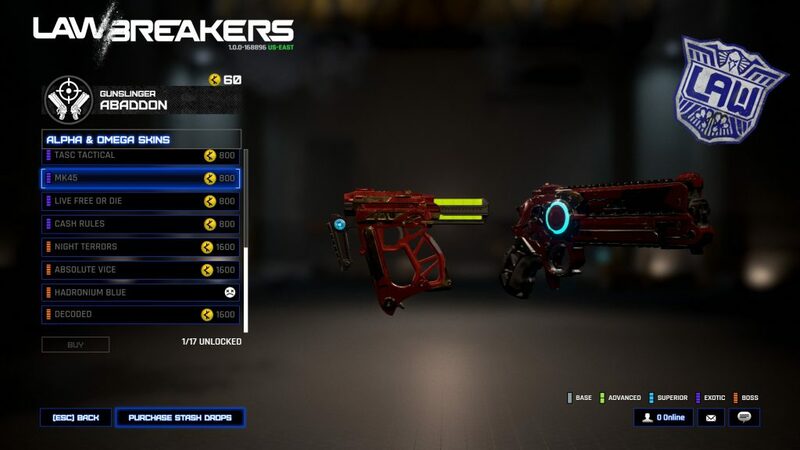 It would have been cool to see LawBreakers have its own unique system for unlocking skins such as “x amount of headshots with this weapon” or “get this many kills in a row” to unlock certain skins. Granted, there is a bit more variety when it comes to skins. 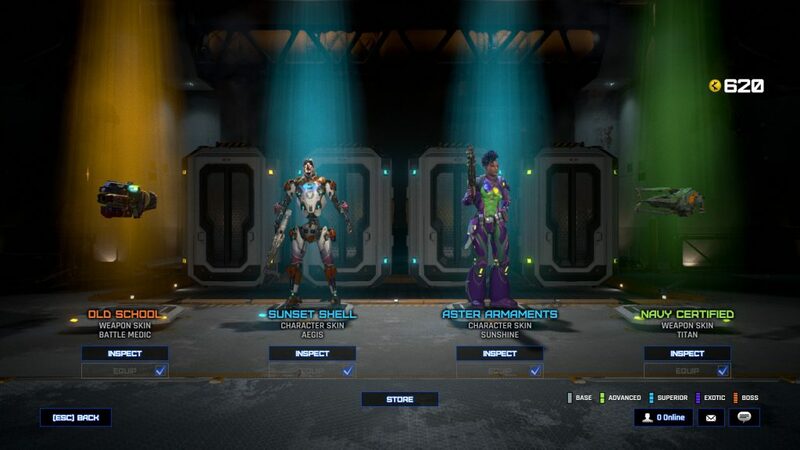 You unlock character skins and weapon skins separately so you’re able to mix and match different skins to make the character your own. When you get a duplicate cosmetic you’ll get credit points which you can spend on skins or whatever you want. There are also profile portraits, stickers to put on your weapons and footprints you can unlock. I really like the different footprints. If you manage to kill an enemy with the melee attack, which is a kick for each character, your boot imprint will be on their screen until they respawn. It’s fun leveling up and unlocking different skins to mix and match with. It gives you that sense of progression and I’m enjoying the process. Here are some screenshots that I captured while playing. This title is hard to get screenshots while in the middle of gameplay! Yeah, I wanted to get some cool screenshots but I’m also still trying to win! I love the art style of LawBreakers. All of the textures, models, animations and what not… You can tell that a lot of passion is behind this game. It’ll be cool to see what comes next as far as new classes, maps, skins and game modes to come! LawBreakers… Should You Buy It? If you’re into arena shooter, objective based games then it’s at least worth giving a shot. 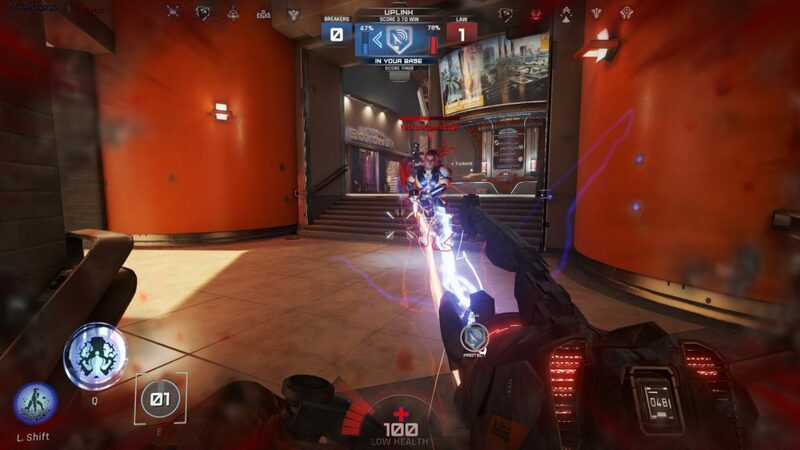 There could be a larger player base for LawBreakers but that doesn’t mean you aren’t going to be able to find a match right away. The only time I ran into matchmaking issues was when I was trying to play very late at night, it took a bit longer than usual to find a match but once I found the one, I didn’t have problems from there on. It’s not just an Overwatch clone. There are unique aspects to it and it’s its own game. For $30, I’d say it’s worth it. Especially if the developers keep up with the game and keep on adding new things. So, do you think the developers of LawBreakers are in it for the long haul? What do you like most about LawBreakers? Tagged arena shooter, lawbreakers. Bookmark the permalink.